These are the perfect "accent" for our bedding in our master bedroom. That said, they are large, so pay attention to the dimensions. Constructed from luxurious memory foam, both of these micro-cushion pillows are the perfect way to bring an extra level of comfort to any bedding. The pillows are designed to contour against the curves of your body for a truly one-of-a-kind sleeping experience that is perfect for you specifically. Each pillow comes with a removable case that is machine washable for your convenience. We purchased these pillows to go along with our new BeautyRest 4 inch gel memory foam topper. 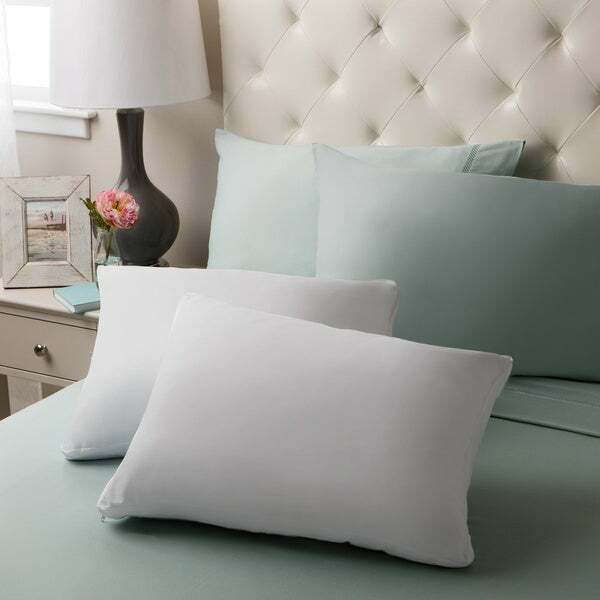 The pillows are very nice quality and cradle your neck and head well. They return to their original shape. They fit well in standard pillowcases. My husband absolutely loves these pillows. He had a neck injury in a car wreck a few years ago, and has trouble finding pillows that don't make him hurt when he wakes up in the morning. For my husband, it was almost instant relief. For me, with some degeneration in my neck, I've had a little more trouble getting used to the pillows. The first few days, I woke up witha very stiff neck. I'm finding though, that it is getting better. I would recommend these pillows to someone looking for a thicker type pillow with memory foam technology. My husband and I are both side sleepers, and these pillows seem to work well for us. Best "foam" pillow this feather-lover ever tried! There were only 8 reviews when I bought mine. 1 or 2 said "small" or "odd-shaped" BUT fellow feather pillow lovers liked them so I ordered. I've had feather pillows since I was born, with a few exceptions. I've tried many versions of "miraculous new"memory foam pillows to avoid rising price of good feather pillows. Well, these are the first foam type to ever rate as my primary (under my head) sleeping pillow. Some said the pillows don't maintain shape. *I don't know what the differences in reported quality are about! Maybe there are different factories making?? My pillows are perfect standard size for standard pillowcases, comfortable, & hold their shape fine even after rough treatment. I've had mine for a couple of months & they are as standard-shaped as day of arrival. Better than solid memory foam pillow because these can be 'squished around' for support needed in different sleeping positions. Standard pillowcases available anywhere fit perfectly. These pillows are very heavy, but have a nice medium firm comfy feel. I was encouraged ... however, after opening the plastic surround each pillow the chemical smell was over whelming! After searching for the packing/return label/invoice I found a small slip of paper telling me that there would be a 'slight' odor with this pillow that was normal for memory foam pillows, to let them air for 24 hours and the smell would dissipate. I did but they still had the strong chemical smell so I let them air for another 24 hours. Finally the smell wasn't as strong (but still very detectable) so I used them when I changed my sheets that night. I woke up with a terrible headache, my hair, clothing, sheets and general area that came into contact with the pillows had the chemical small. I used the pillows for another 3 days and the smell was still strong. I returned them and of course Over Stock refunded about *** my purchase price. I then had to contact OS and ex[plain that the pillows were on the verge of being toxic and I wanted my full refund since the product was defective. The did return the balance of my purchase. I will be ordering fro OS in the future but please BEWARE OF THESE PILLOWS! I JuST can never have enough pillows (*_*) It seems they have a habit of walking out the door haha. Kids! I sleep very comfortably with my gel memory foam micro-cushion pillow. What it states is what it does and feels like. This pillow has Gel Memory for sure! I have not heard any of our guests complain after a good night's sleep in our home with these pillows. I love that you get the comfort of a pillow style and the benefits of memory foam. You can still pillow cuddle unlike with the contour that restricted my sleeps style. I should have read the dimensions, so this is my fault. But they are little and like bricks. They are far too firm to be used by my eight year old as her head isn't heavy enough to sink into this pillow and they are far too small to use on my queen size bed. So they will go in the camping stuff. I found the pillows to be very comfortable. The size does not exactly fit a Full Size bed Pillow Case but the comfort diminishes that issue. I ordered these pillow, because on the description, it said that they were 2 inches in width. At first it looked like it was 2", but when it came out of the package, it was soft, but still not 2 inches. These pillows did not come tightly packed, and not wrapped in plastic. They are shredded foam. I do not like them. Not as advertised. These pillows have made my sleeping time so very restful. I get enough leverage to breath easier and the coolness is a blessing. A wonderful product and I highly recommend them. These pillows are small, so the don't fit our Cali king/king pillow cases at all, but they are wonderful. The small cubes of memory foam are perfect compared to one large piece. I have been very diligent about fluffing them when I make the bed and they bounce right back to think fluffy little pillows. Now when I say little, they are normal sized, they just are a tad shorter than the ones we had prior from Wal-Mart. But they aren't to hard or too soft. I've had mine for about two-weeks; with no indication of them 'going flat'. However, if your desire is something for 'soft as a cloud' --this one isn't, but is dependable every night. These pillows are nice when you first lay down. They are comfortable and supportive. I find myself flipping the pillow over because everything tends to gather or clump. After flipped all is great again. Maybe it's just how I sleep? I don't know, but I would consider purchasing again because they are comfortable. These are okay, but can give you a crook in your neck if they slide off a bit. Another great choice, it is even better then the LineSpa gel infused. No issues with either type...both give great support but are soft. Great pillows for any type of sleeper! I prefer these over the $100 pillow I bought right before them because they are soft yet firm and support my neck to where I don't have a headache anymore when I wake up in the morning! Super soft and great to sleep. They don’t reform to their original shape. They are standard sized pillows. Fit Queen/full pillow cases. "I just purchased this pillow. The gel has an odor. Will this ordor go away"
let them air out for about 12 to 24 hours and the smell goes away. "Do you have pillow cases to fit these pillows?" Standard pillowcases are available anywhere and that's what works with these so you're all set! By the way, I remember reading a couple of reviews about the pillows not maintaining their shape. I cannot imagine what these folks did to their pillows! I've had mine for a couple of months now and they are just as normally shaped as any standard pillow. "I know it says that the pillow cover can be washed, but can the pillow itself be washed in the washing machine and dried in the dryer?" It is not recommended that the pillow itself be washed. I sleep better on memory foam. And while I sleep cold, my pillows always end up being too warm, and I feel like I'm suffocating. So I want to try the gel ones and see if they stay a little cooler.